Save $5 by entering the 2020 Dr. Crowdis Run 5K /10K with a t-shirt before September 1st. Click on the link below. The 23rd Dr. James H. Crowdis Run will be held January 19, 2019 starting at 9:30am ET. In addition to the 5K and 10K, there will be a one-mile run/walk. An entry form is posted on this site. The 22nd Dr. James H. Crowdis Run has been scheduled for January 20, 2018 at 9:15am. We're proud to announce that the Dr. Crowdis Run will be the kick off activity for the Early County Bicentennial Celebration (1818-2018). Severe weather threatened the Dr. Crowdis Run on January 21st but held off until shortly after the awards ceremony. We did have unseasonably warm and humid weather. Winners of the 21st Dr. James H. Crowdis Run 5K were Trevor Cleveland (19:23.3) and Alli Hay (20:23.5). Winners of the 1st Dr. Crowdis 10K were Patrick Whitehead (36:23.9) and Katie Sheppard (54:52.9). We've MOVED and GROWN! 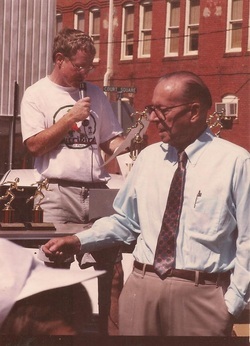 The 21st Dr. James H. Crowdis 5K Run will be the 1st Dr. James H. Crowdis 10K Run. In 2017 our run will be held on January 21st with both races starting at 9:15am ET. The 20th Dr. James H. Crowdis Run was won by Patrick Whitehead (17:06.8) and Sheryl Rosen (19:13.1). Both times established new course records. Complete results have been posted (click the page link above). Age graded results will be posted in a few weeks. The 20th Dr. James H. Crowdis run will be July 9th, 2016 at the First United Methodist Church beginning at 8:15am. Thanks to the Bank of Early, The 4th Out Sports Grille, Pioneer Hospital of Early, Piggly Wiggly and Grist Oil Company who have agreed to be sponsors of the 2016 Dr. Crowdis Run. Age adjusted results have been posted. Click on the "2015 Age Graded" tab above. Winners of the 2015 Dr. Crowdis Run were the same as last year: Myles Gibson (18:09.5) and Margaret Winkler (23:01.3) Click on the 2015 "Results" tab above for complete results. Our 2015 sponsors are: Bank of Early, Grist Oil Company, The 4th Out Sports Grill, Piggly Wiggly and Pioneer Community Hospital of Early. THANKS!! Our course has now been certified by USATF! The certification # is GA15001WC. The Dr. Crowdis Run is a Run and See Georgia Grand Prix race and a Dothan Runners Club Grand Prix race. It is a Peachtree Road Race qualifier. The 2014 Dr. Crowdis Run was won by Myles Gibson (18:12) and Margaret Winkler (23:24). Updated overall results are posted here. Also there are two photo galleries posted here and more photos on Facebook. Check Herb Wills' Trouble Afoot blog for a story and dozens of photos. Thanks to our 2014 sponsors The Bank of Early, The 4th Out Sports Grille, Piggly Wiggly and Pioneer Community Hospital of Early. In March 2014 we contributed dozens of running shoes to a charitable organization. These shoes were donated by participants in the 2013 Dr. Crowdis Run. We also contributed a large number of toys to a local organization for distribution last Christmas. Thanks for your kind donations and also to those who contributed to the Heart Fund! Winners of the 2013 Dr. James H. Crowdis Run were Chase Harris (17:31) and Paige Braswell (21:11), both of Bainbridge. Go to our results page for an overall list of times and places. THE BANK OF EARLY, THE 4TH OUT SPORTS GRILLE, PIGGLY WIGGLY, and PIONEER COMMUNITY HOSPITAL of EARLY, and Dr. Vincent Barker, Dr. Lamar Brand, Brandy Floyd, P.A. Also, thanks to the First United Methodist Church, the Auction House, and the Early County Sheriff's Department. 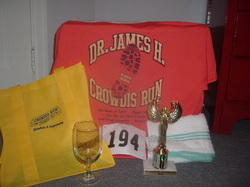 Participants and award winners in the 2012 Dr. Crowdis Run received a t-shirt, bag, sweat towel, trophy, imprinted glass. The Dr. James H. Crowdis Run was originally known as the Blakely Heart Fund Run. Dr. Crowdis was local chairman of the Heart Fund for many years. If you would like to contribute to the American Heart Association in Dr. Crowdis' name, please click HERE.